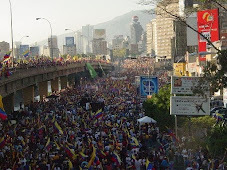 Venezuela News And Views: Alas! Antanas Mockus will never be president of Venezuela! Alas! Antanas Mockus will never be president of Venezuela! As a supplement of my previous post where the decision of Colombia's government to ask Colombians to avoid travel to Venezuela was discussed, I could have included the latest Colombian polls, had I known them. The sudden rise of the Green candidate, Antanas Mockus, to the second spot in polls is throwing the election up in the air, and might be explaining some weird decisions in Bogota. Nobody really knows what could happen in a second round ballot between Uribe's candidate, Santos, and the new darling of the green/independent vote, Mockus. No one ever considered such a run off, always assuming that it would be between the Uribista candidate and either the Conservative (most likely) or the old Liberals or even the left Polo. In the second round Santos was expected to breeze through, the only question here was if Uribe coat tails would be enough to carry him on the first round. They are not. Noemi Sanin, the Conservative candidate is sinking fast as conservatives seem to rally around Santos, though not in droves as some seem to find their way to Mockus for the time being. Why? After all, Uribe and the Conservatives won a parliamentary majority in last months elections. How come suddenly everyone is scrambling to confront the sudden Mockus surge? Sanin, although an ally of Uribe was not a friend of Santos and said that she would run if she got the nod from her party. She also has a past with Mockus. Her party was expected to give the nod to another guy who probably would step down before the first run ballot allowing, hopefully, for a straight Santos victory. But Sanin won and the Conservatives suddenly found themselves having to battle an electoral campaign that, well, they really did not feel like battling, more comfortable as the junior partners of an Uribista coalition. Uribe's phenomenon and success have started a tectonic movement in traditional politics forcing slowly but surely the fusion of the traditional right, the Conservatives, and the more "neo-liberal-yet-socially conscious" one of Uribe. Uribe years have also seen the drain of the Liberal party of Colombia (social democrat like) but not as a vigorous tectonic shift among the center left to left groups. On this respect Uribe is more responsible of having regenerated the right through his success and thus attracted many Center and center left votes leaving the left and the Liberales battle for roughly 2/5 of the electorate, a situation meant to continue as long as both the Polo and the Liberales do not endorse fully the anti FARC combat and find relevant themes for Colombians. So all seemed to be set for a third term of Uribe without Uribe through his successful ex defense Minister, Santos, of proven FARC destroying ability. I am not a specialist of Colombian politics and certainly cannot explain the intricacies of what is going on. At best I pretend to describe how a foreigner understands Colombia's current situation, one that is monitored closely by Venezuela since our destinies are joint at the hip through our extensive common border. Antanas Mockus has been the successful mayor of Bogota. He is the one that started the recovery of a city caught in fear from guerrilla terror while beset by modern problems associated with third world cities growing pains. And in a single tenure he managed the awesome feat of bringing back to Bogotans self esteem. So much has his success been that his successors (no immediate reelection in Colombia then) had to follow his basic guidelines transforming the disaster of Bogota into one of the most pleasant cities of South America, as I could see by myself three years ago. He was reelected Bogota mayor a couple of terms later. Antanas Mockus would never be elected president of Venezuela. In fact, he probably would never make it even to second position. He is too intellectual, too much of an academic manager to please the Venezuelan crowds with desires of immediate rewards if they vote for candidate X. He is also too white, too foreign, for Venezuelans. The only fully white president of Venezuela in about a century was Caldera, and he was probably as obviously intellectual as Venezuelan people would be willing to accept. The last time an intellectual candidate run it was Uslar Pietri in 1963 and no one dared to try after they saw what happened to poor Uslar at the hands of ADecos, the chavistas of that time. The only semi intellectual candidates to run since, and lose, were Eduardo Fernandez and Alvarez Paz. In fact, now that I think of it, the defeat of brilliant Uslar Pietri probably turn off from politics the true elites of the country, the educated ones who either turned to the radical left (Petkoff et al.) or simply ignored politics, finding them too dirty for them and eventually allowing for pseudo-antipolitical monstrosities like Chavez to reach power. At any rate, it is doubtful that Mockus will prevail in the end, even if his admitted mild Parkinson has not hurt him. 40% woudl be a notable achievement. Mockus is probably too far from the agrarian masses of Colombia who would vote for the anti FARC candidate, Santos, at least in the second round. If Mockus wants to win the second round he is going to have to curse Chavez and the FARC, which he could do as he already is promising that the "Seguridad Democratica" policies of Urbe will be maintained. If he keeps on, conflict with Chavez would be inevitable as Chavez will consider him a civilian weakling and test him very soon. I think the Colombian establishment is quite scared already, as not only Uribe made the blunder to intervene in the campaign to attack Mockus, but there is already talk of the union of all traditional parties against Mockus in a second run if necessary. And yet I do not think that a Mockus presidency is such a thing to fear. A US Democractic Congress would vote ipso facto the FTA if Mockus is elected, though as a concession to his green, center left base Mockus might not want to get an FTA (it is less of a consensus as the "Seguridad Democratica", I understand). Mockus seems also intelligent enough to understand that the "seguridad democratica" is supported by a huge majority of Colombians, that it is successful and that peace with the FARC is impossible. In fact under Mockus we could see additional creativity to an Uribe who seems to be unable to transition from a military victory to a political victory: the FARC is defeated but not eliminated. Mockus in fact could be a right wing Green President since the legislature he inherits is controlled by Uribe folks. From the start Mockus would have to form a large coalition government that would have to be in the Center, anti FARC and anti Chavez, or he would be unable to rule and the country would fall fast into chaos. After his success as Bogota mayor, twice, I doubt that Mockus would speak of constitutional assembly and rather do as Uribe in his first term when he run as a dissident Liberal without congressional majority. Whatever it is, I am green with envy at a country which can run such a fascinating campaign, with such qualified people after having had the courage to bar from a third term a successful president. We are so far behind in Venezuela that words fail me. Not one of Venezuela's current leaders, from Chavez to Ramos Allup, can compare to Santos, Sanin, Mockus and even the minor candidates. Watch the TV debates if you do not believe me. 1) I have always wondered why Green had to be associated with left, hence its general inability at reaching power as the traditional left holds its hostage just as it holds hostage gay movements and other civilian progressive movements. The right should have long ago tried to reclaim the Green label, something not that difficult when one realizes that the survival of our species makes common sense for all. The conservative moral right has lost great opportunities by not embracing fast enough social concerns such as abortion, gay rights, climate change, clean water, etc.... If the post Marx left has survived to this day it is because it sucked in such movements that were not necessary for theirs to grab. I think part of his appeal is the fact that people know very well that, if elected president, he's going to do that to Chavez RIGHT ON HIS FACE if the caudillo gets uppity in a Unasur meeting. You didn't think Chávez could win? I remember when he was pardoned in 94 I thought he could do like Hitler and reach the presidency now by charmin the people. Just a passing thought. And then again when Hugo Banzer was elected president in Bolivia I was shocked, how stupid can people be? he's no longer a dictator and yet they let him back into power? People should ban from politics wanna be dictators yet they let them into power with so much ease. Never was Bolivar more right than when he said "an ignorant people is the blind instrument of its own destruction"
I found the documentary very good and made me a little envious - where are our Mockuses and Peñalozas? A fascinating essay, Daniel. I don’t know where else I would get such a perspective. I loved my time in Bogotá, even with its rain, cloudy skies, and crime. In part this is because I am very partial to tropical mountain climates and the Andes. I was told to not walk the streets of Bogotá, but did so safely- fingers crossed. I saw enough to realize the validity of the warnings, but my intuition carried me through when it came to the con men- who are definitely there. The right should have long ago tried to reclaim the Green label, something not that difficult when one realizes that the survival of our species makes common sense for all. The conservative moral right has lost great opportunities by not embracing fast enough social concerns such as abortion, gay rights, climate change, clean water, etc.... If the post Marx left has survived to this day it is because it sucked in such movements that were not necessary for theirs to grab. While what you write is largely applicable to conservatives, there are exceptions. For example, consider Russell Kirk , one of the first contributers to National Review and author of The Conservative Mind. "The right should have long ago tried to reclaim the Green label, something not that difficult when one realizes that the survival of our species makes common sense for all. The conservative moral right has lost great opportunities by not embracing fast enough social concerns"
For me the Mockas character inspires a bit of ambivalence.First of all, i am an admirer of the deeply soulful Lithuanian culture so this creates quite a natural bias for me.Shame.Shame. No doubt he is an interesting candidate though he is apparently another charismatic ,likely to smite some rather than to work humbly. "Famous initiatives included hiring 20 mimes to make fun of traffic violators, because he believed Colombians were more afraid of being ridiculed than fined. "I could not help but smile. Sounds like he is looking for solutions here where they really lie and not just the sterile useless status quo ones. Indeed interesting and it will be fun to follow his career. Daniel, you summarized the situation very well and very sad indeed. People think they get what they want when most times they get what they deserve. Too white? I dunno about that. Color of skin has not really been an issue with Venezuelan voters. In fact, Chavez is the darkest President we've had in a while. Intellectual abilities / you may have something there. But the racial profiling issue was out of left field, in my humble (and very white) opinion. I highly recommend the video that giftzahn linked to about the transformation of Bogotá. Well worth the hour. Thanks, giftzahn. and you probably thought Obama would be a moderate too. Pay attention to the word "Argentina" in the 1st and the 2nd paragraphs. I confess! When I saw his name yesterday (apparently Bayly is endorsing him) I could not stop thinking of many ways in which to use his name as a joke. No fault of his - his parents should know better! Anyway, we are the joke - by we I mean Latin Americans and no wonder we are called underdeveloped! i think you are making too much of my observation. if it is true that skin color is not a major political liability in venezuela (at least until chavez) it is also true that white candidates for president have not fared as well as off white: uslar pietri, lorenzo fernandez, eduardo fernandez, oswaldo alvarez. as a kid i remember that COPEI was called the party of the white and the rich. this being said, it did not stop you from being elected, it sort of required you to kiss even more babies. and your point as to this post is? Daniel, was that a censure of my post? I commented on the lines of Juan Cristobal, but with examples. What you call "pure whites" are anyway a rather tiny group. How many elected presidents have we had in the last 40 years? Not very many. And before that, most heads of states were definitely on the white spectrum, it was not like we had many foreigners before the fifties. Race in Venezuela, in spite of racism, is comparetively a minor thing and it is definitely the black who would have more problems getting elected. More need to kiss babies if white? Give me a break. no censorship, you messed up your entry. that is all. Regarding Mockus having the first name of Antanas, I am reminded of a Maracucho fellow employee who had the nickname of Satanás, perhaps because he was overflowing with energy. "Both countries also agreed that Argentinian President Hugo Chavez and Nicaragua’s President Daniel Ortega will meet in Caracas on July 23"
Thanks for the video on Mockus. It would interesting to read the international reaction to any real possibility of Mockus winning this race. I, too, have my doubts on whether he would win. But should he win, it would once again throw everything into focus, just as the first Uribe victory had. For so long, we've been used to the idea of Uribe being a lightning rod for critics, from accusations of him being connected to the paramilitaries to him being generally uninterested in the lives of common people. With Antanas, you don't have those to easily peg him with. First, as the video showed, he started his political career from the streets after leaving his rector job at the University. Second, his style is quite unorthodox and can't be easily confused with Uribe's style, which come from a traditional background. At the very least, he would represent a clean break from the depressing lineup of LatAm presidents.